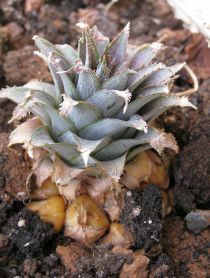 I have heard at least a few times the story about planting the top of a pineapple, that supposedly should grow into a new pineapple. It sounds a bit strange to me, but there is only one way to find out for sure.I’m going to give it a try. I’ll try the experiment with a tasty pineapple that originated from one of the Canarian Islands, so the climate should feel similar to the pineapple. Maybe it will work and I’ll be able to harvest some pineapple soon.